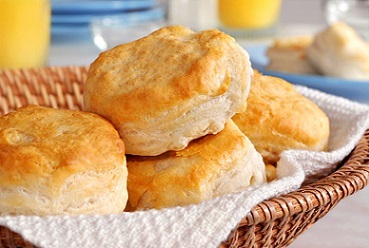 Buttermilk Biscuit Recipe from Real Restaurant Recipes. Tender, mouth-watering! 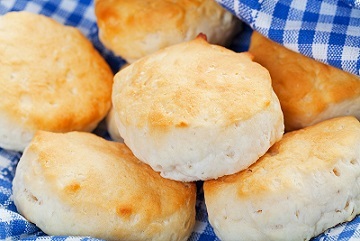 This restaurant Biscuit Recipe creates a light, tender, mouth-watering bread for any time and any meal! Actually, this recipe was one of my grandmother’s originally. I tried it when I opened the restaurant for breakfast and have used it ever since. Preparation time: about 20 minutes...the best 20 minutes you'll probably ever spend cooking! Serves 12-16. 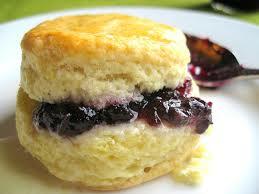 Some of my restaurant customers (guests) order two of these with jam or honey in the morning with a cup of coffee or tea. It serves as their breakfast. But these are so good you can enjoy them at lunch or dinner or as a snack. I do! 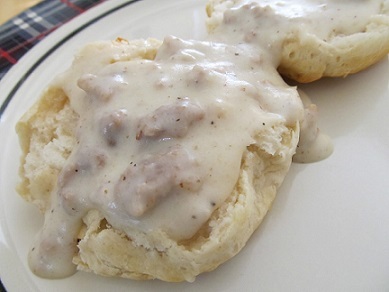 Split these and ladle my hot sausage gravy over them! This is really goooood! You might consider serving these with a hot bowl of soup or delicious beef stew. This bread item, even when served with certain other items, is true comfort food. Thanks for visiting! ENJOY the recipe and the company of those you share it with!